Ten years on from the collapse of Lehman Brothers, and the financial system is safer, more robust and governance has improved. The previous “light-touch” approach to regulation has been replaced by a much stricter supervisory regime, but while the world’s biggest financial institutions have adapted, striking differences still exist between US and European banks—and only the next crisis will tell which is most effective. At the end of 2017, there were 30 financial institutions defined by the Basel Committee on Banking Supervision as globally systemically important banks (G-SIBs). These are defined as the banks that pose the greatest threat to the global financial system. Of these, eight were in the US and 13 in Europe. The boards of G-SIBs in both US and European jurisdictions have adopted some common features since the global financial crisis, and there is much to admire. They have become smaller in size, more independent and more experienced in terms of financial industry experience and risk management expertise. Research from Aktis, a leading provider of bank governance data, shows some striking similarities in the adoption of governance good practice. In both the US and Europe, the average board size of G-SIBs has shrunk to 13 members from 15 in 2007. Smaller boards are considered more effective when it comes to communication, co-ordination of tasks and decision-making effectiveness. G-SIBs on both sides of the Atlantic have segmented their boards into more specialist committees. According to Aktis, the average number of board sub-committees at US banks increased to 5.9 in 2016, compared with 4.1 a decade ago. In Europe, G-SIBs had an average of 5.2 board committees in 2016, compared with 3.8 in 2007. Banks have radically improved their risk management processes, with all G-SIBs in both the US and Europe establishing specialist committees. This stands in stark contrast to a decade ago, when only JP Morgan had a standalone risk committee, according to Aktis. There has been a sharp rise in the number of banks establishing conduct and value committees following the billions of dollars paid out by big banks in legal fines as a result of industry-wide malpractice: from PPI insurance in the UK, to the rigging of foreign exchange benchmarks across the globe. The improvement in corporate governance has come about as a result of the introduction of new regulations, such as the Capital Requirements Directive IV (CRD IV), which called for an increase in independent non-executive directors on bank boards. 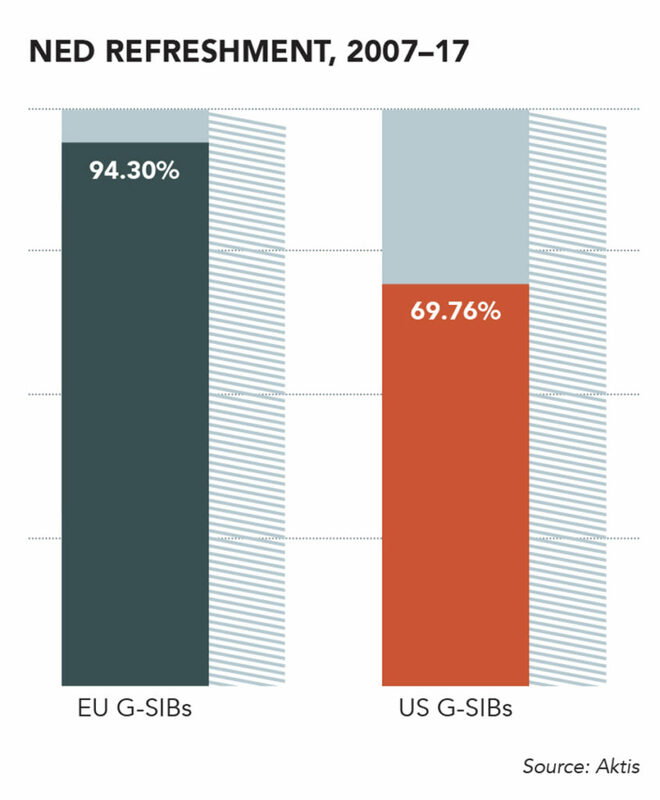 For the large part, G-SIBs in both the US and Europe have adopted international best practice but they still have striking differences, not least in their fundamental approach to leadership; US banks still believe in the joint CEO/chairman role, while European banks have embraced a dual-board structure. According to Aktis, 88% of G-SIBs are still led by a single executive serving as both chairman and CEO. Only two US G-SIBs have split the role. One is Citigroup, which was the biggest casualty of the financial crisis; and the second is Wells Fargo, which split the role in the wake of a retail banking scandal in 2016. As for the rest, the CEO holds both roles, effectively controlling the board. This stands in stark contrast to European G-SIBS, where no bank has a combined CEO and chair, and in most cases, the chairman holds a non-executive role. This divergent approach to leadership at the very top of the institution has some obvious consequences. In the US, the joint CEO/chairman holds the power, and governance is centred more on individual than on collective leadership. In European banks, there is a duality of approach, where the supervisory board is intimately involved in setting strategy for the management board, and hiring and firing the CEO. “The dual board structure brings complexity, but it is less risky, because the management committee is held accountable by the board,” Nestor adds. Moreover, non-executive chairs are almost universally preferred among European G-SIBs, with only HSBC and Santander having an executive chair. Among US G-SIBS, the average tenure of board members stood at 7.7 years in 2016, compared with 8.1 years a decade previously, according to Aktis. This differs significantly with European G-SIBs, where average tenure has fallen to 5.3 years, from 5.6 in 2006. By contrast, European banks such as Credit Agricole, Barclays and Standard Chartered have renewed their entire board in the past decade, representing almost a quarter of the region’s G-SIBs. In the US, only Wells Fargo has conducted a complete overhaul of its board since 2008. Regular refreshment of the board is important because it can promote diversity, strengthen expertise and bring fresh perspectives that challenge the status quo. This is a crucial step in avoiding groupthink—an ingrained philosophy that can prevent management and boards from anticipating risks. A more powerful board has led to a higher level of CEO churn in European banks. 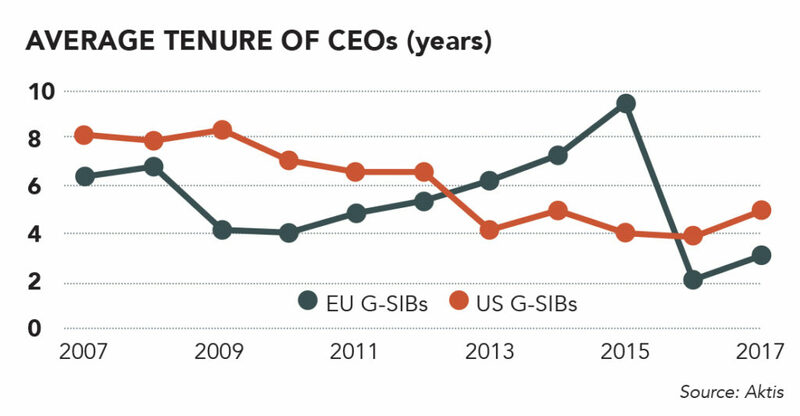 Since the crisis of 2007, all European G-SIBs have replaced their chief executive, with a number having been ousted by the board. However, there is a balance to strike. Aktis found that better-performing European G-SIBS during the financial crisis in terms of pre-tax profits tended to have more mature boards. For example, Santander and Nordea, which largely avoided the crisis, had an average board tenure of 9.7 and 6.5 years respectively in 2016, according to Aktis. “In banking, stability comes at a premium,” says Nestor. 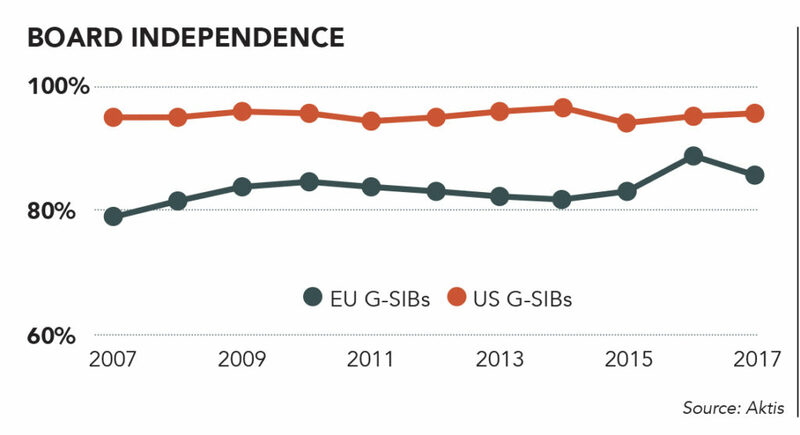 In terms of performance, the US G-SIBS have emerged stronger from the financial crisis. They have posted bigger profits, and are trading at higher multiples than their European rivals—particularly those with big investment banking arms, which triggered the crisis. Firms like Barclays and Deutsche Bank have been through several strategy iterations since 2010. Barclays is on to its third CEO, and Deutsche Bank has had five CEOs in the same period. But many of the gains made by US banks have to do with regulation rather than governance. US supervisory bodies formulated a rapid and robust response to the crisis, recapitalising the banking sector through its Tapered Asset Relief Programme (TARP). In crude terms, the US banks took their medicine early and that enabled them to rebound much more quickly. The US followed TARP with tough stress tests and, as a result, its banks hold more tier-two capital than their European counterparts. “By and large, US supervisory authorities such as the SEC, the FDIC and the Federal Reserve have paid more attention to prudential supervision than governance,” says Nestor. With the exception of the UK, European supervisory bodies did not force a broad re-capitalisation of the banking sector, but instead turned their focus to governance reform. The idea of a joint CEO/chairman has been banished and with it the previously common practice of bank bosses moving to become chair when they step down as CEO. European banks have embraced global reforms, such as the Basel Committee’s corporate governance principles and the Financial Stability Board’s adoption of the G20 proposals. Some jurisdictions have gone further. UK banks have ring-fenced their investment banks to protect depositors in the event of a fresh liquidity crisis, while it has also introduced the Senior Managers Regime, which holds individuals to account for missteps and governance failures. While US banks can point to strong performance under their combined CEO/chairman structures, it’s hard to know how much of their success can be attributed to governance. US supervisory authorities have dragged their heels in adopting some aspects of global standards, but there are signs that is changing. Last year, the Federal Reserve published a consultation paper on a corporate governance proposal to enhance the effectiveness of boards of directors. The Fed’s proposal aims to refocus supervisory expectations for the largest firms’ boards of directors on their core responsibilities, which will promote the safety and soundness of the firms. The corporate governance proposal is made up of three parts. First, it identifies the attributes of effective boards of directors, such as setting a clear and consistent strategic direction for the firm as a whole, supporting independent risk management, and holding the management of the firm accountable. For the largest institutions, Federal Reserve supervisors would use these attributes to inform their evaluation of a firm’s governance and controls. Second, it clarifies that for all supervised firms, most supervisory findings should be communicated to senior management for corrective action, rather than to its board of directors. And third, the proposal identifies existing supervisory expectations for boards of directors that could be eliminated or revised. If implemented, these proposals would bring US bank boards more in line with their European rivals, although the Fed’s consultation phase comes at a time when the Trump administration is considering loosening some of the Dodd-Frank reforms. Both US and European banks have adopted more robust governance in their overseas operations. 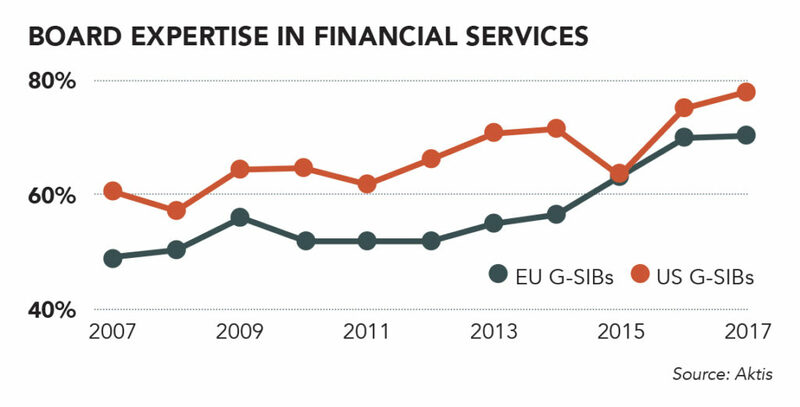 European G-SIBs have been forced to create US holding companies with their own capital and liquidity thresholds, and have appointed separate boards of directors. 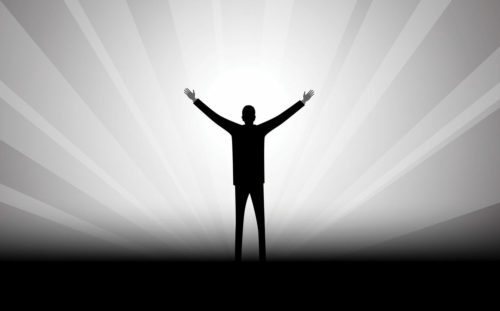 US banks have also appointed independent boards for their overseas operations. While US banks can point to strong performance under their combined CEO/chairman structures, it’s hard to know how much of their success can be attributed to governance. Meanwhile, it should be remembered that Lehman Brothers was brought to its knees by an all-powerful management team, led by a joint chairman/CEO who wielded excessive power. The same can be said of Bear Stearns, whose chairman and chief executive Jimmy Cayne was at bridge tournaments while the bank he was responsible for teetered on the brink of collapse before a Fed-enforced takeover by JP Morgan. For all of its complexity, duality makes for a safer control environment, while the introduction of measures that hold individuals accountable for failures constitutes good governance. At the same time, European supervisory bodies have micro-managed governance, while the Basel Committee is pushing ahead with new rules that force banks to adopt standardised risk models, a move that could potentially undermine their proprietary controls. The past decade has been remarkable for a relative lack of volatility, and an extended bull market supported by central bank largesse. With volatility returning amid an uncertain geopolitical environment, the robustness of banks’ new governance structures in the face of a future downturn will be a true test of how far G-SIBs have come on both sides of the Atlantic.